​We're a small herb farm & apothecary in Chelsea, VT specializing in farmgrown & handcrafted teas, culinary herbs, medicinals, herbal remedies, and body care products. Join our team! We're currently seeking a Field Assistant for our 2019 season. Learn more here. A delicious herbal vinaigrette blend of herbs from our farm, including: basil, dill, fennel, and tarragon. Perfect for adding a pep to simple oil & vinegar salad dressings, creamy sauces, and more! This well-rounded herbal blend is sure to spice up your life in a really, really good way. A soothing remedy for farmers and non-farmers alike! We enjoy using this herbal balm for dry, chapped skin such as hands, heels, and elbows. We infuse organic olive and sunflower oils with freshly dried herbs from our farm to create a balm that’s feels great and is extremely nourishing for your skin. * The deep green color of this balm let's you know it's loaded up with herbs! This all natural balm is made of freshly dried herbs from our farm infused in organic olive or sunflower oils. Not to be used on puncture wounds. If applying to a wound or cut, be sure to clean the thoroughly before applying. Ingredients: Olive or Sunflower Oil extract of Calendula, Chamomile, Comfrey, Dandelion, Mullein, Plantain, St. John's Wort; Beeswax; Vitamin E; Rosemary Extract. Enjoy this herb-infused lip balm in a sleek slider tin. Thin enough to fit into even the smallest pocket, and infused with healing and soothing herbs, this lip balm is your best bet for healthy, moisturized lips. Scented with peppermint, this luscious treatment soothes chapped lips with an herbal twist. A Free Verse Farm best-seller! Ingredients: Calendula, Chamomile, Comfrey, St. John's Wort, Organic Sunflower Oil, Organic Olive Oil, Vitamin E, Essential Oils, Rosemary Extract. A gently nourishing and soothing cream for your skin, our Comfort Cream penetrates deeply to provide cooling refreshment and a healing touch for irritations such as rashes, burns, stings, small cuts, and more. * This deluxe cream will remind you that excellent body care does not require synthetic ingredients. We all need to take it easy now and again. A floral & earthy blend, this tisane is nourishing & soothing for mind & body. We love to drink it before bed or at any point in the day when we need a little space to unwind. Ingredients: Scullcap, Wood Betony, Red Clover, Calendula, Chamomile, Catnip, Milky Oats, Lemon Balm, Red Raspberry Leaf. Our delicious culinary sage ground and blended with sea salt into the perfect finishing salt! Dedicated to our beloved Green Mountain State, this popular culinary herb blend of basil, oregano, rosemary, thyme, and savory is the perfect touch for a wide variety of culinary adventures. We love to use it in baking, in marinades, sauces, dressings, and to spice up fresh chèvre. Freshly dried herb from our farm. Sign up anytime for a CSA Membership! Choose between quarterly Tea Share or Apothecary Share subscriptions! Sign up by June 15th to begin your membership with a Summer CSA Share! A sample Autumn Apothecary Share. Our Community Supported Apothecary (CSA) subscriptions are an expression of our desire to connect deeply with our community through herbs. Just as a traditional Community Supported Agriculture share from your local vegetable farm provides you with delicious vegetables throughout the year, we offer you a share of our harvests from our herb farm in the form of apothecary products, including delicious culinary herbs, sustaining teas, and supportive remedies, all handcrafted in our apothecary using the highest quality herbs, most of which come directly from our land. No matter what time of year you sign up, you'll be able to look forward to a yearlong engagement with healing herbs grown with joy. Shares are delivered four times per year. You may sign up at any time! They make great gifts too! Unless otherwise requested on the sign-up form, you (or your giftee) will receive the first share at the nearest upcoming season. Exact dates for pick-up and delivery will be communicated to shareholders 1-2 weeks ahead of time via email. Share pick-ups are available at our farm or at the Upper Valley Food Coop. If you live far away, fear not: all of our shares are very shippable to anywhere in the USA! Come camp at our farm with Hipcamp! Choose from one of our awesome campsites! 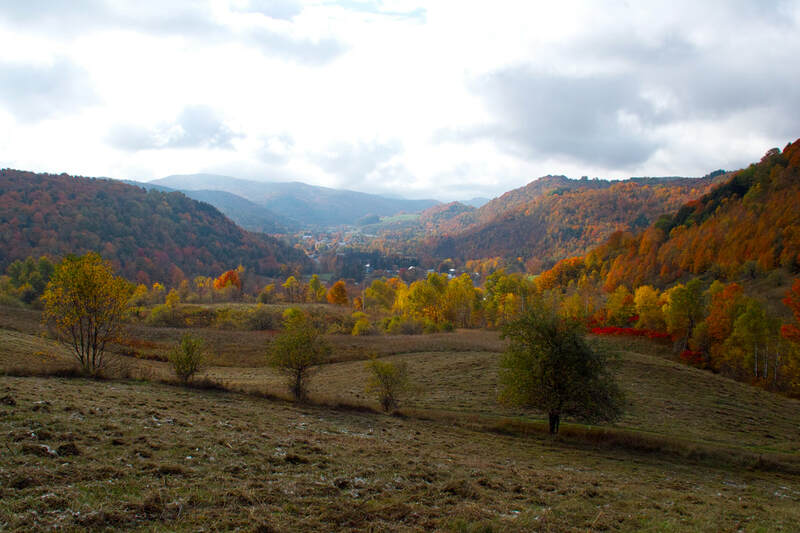 Experience breathtaking views and rural tranquility at our Vermont hill farm surrounded by abundant wildlife as well as our colorful fields of herbs and grazing livestock. We have amenities to make your stay super comfortable like a hot shower, composting toilet, campfires and fresh produce from the farm. For full details, view our campsites listed on Hipcamp. We look forward to welcoming you to our farm! Check out our growing selection of BULK HERBS! Browse our current availability of bulk herbs from our farm, offered in 1, 4, 8, or 16 oz amounts. 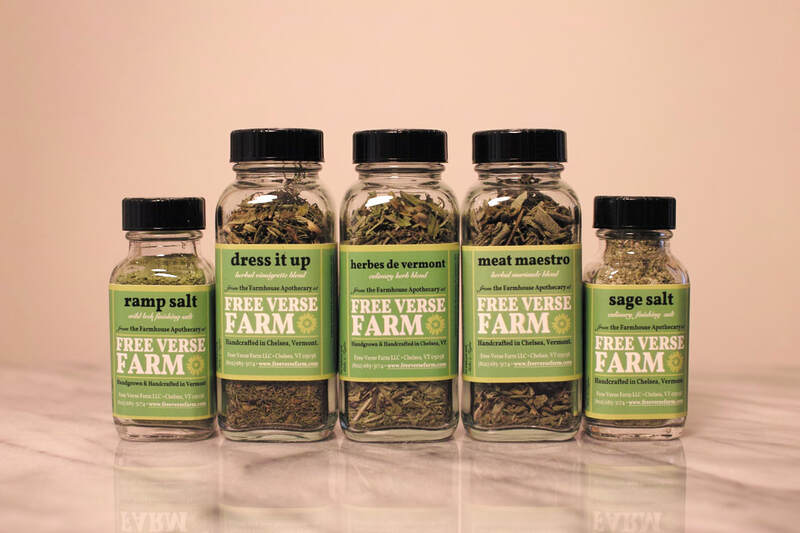 When we're sold out of our own farm-grown herbs, we may offer herbs from other Vermont farms. PLEASE NOTE: If we're sold out of something you're looking for contact us about availability in 2018! If you don't see what you're looking for, please contact us! We are always looking for feedback, so let us know if you have regular and sizeable needs for certain herbs. We love to collaborate and are happy to work your needs into our growing plans for future seasons. Unlike most companies selling herbal products, we grow our ingredients ourselves, which means when you enjoy our products, you're enjoying the unique herbal offerings of our farm in central Vermont. ​Our small herb farm & apothecary farm is located in Chelsea, Vermont, nestled high in the hills that overlook the village. We specialize in Vermont-grown tisanes (herbal teas), culinary herbs, herbal remedies, and herbal body care products. Our herbs and remedies are available through pick-up at our farm, at local farmers markets, stores, online, and through our Community Supported Apothecary subscriptions. All of our products are handcrafted in small batches in our farmhouse apothecary. The majority of our herbal ingredients are sourced directly from our farm. Take a peek at our online apothecary shop for the fullest selection of teas, culinaries, bulk herbs, and handcrafted herbal remedies & body care products. We also have a host of great gift ideas and unique accessories. We also offer Community Supported Apothecary subscriptions! Our herbs are harvested by hand and dried right on our farm. We dry herbs in traditional hanging bunches, as well as in our farm-made herb dryer, "The Herbster," taking the utmost care to preserve the essential constituents that give each herb its flavor and potency. At Free Verse Farm, we consider the health & vitality of our community to be issues of great importance. From our Community Supported Apothecary subscriptions, to workshops & events, to selling at local farmers markets & stores, to offering herbal consultations, we are always seeking ways to support & engage with our community through herbs. You can connect with us daily on social media sites such as Facebook, Instagram, Twitter, or Tumblr, where we frequently post photographs and updates from our farm. Sign up for our newsletter to get seasonal updates from our farm. Contact us if you'd like to visit the farm or host an event here. We love collaboration!